You may want to read the previous chapter on finding out and negotiating the price for your new home here. an expiry date that requires the seller to decide whether they take the offer or not (a short expiry date will force the seller to make a decision in a haste, which might be positive for you as a buyer). Once you’ve prepared all of the above, you submit the offer to the seller and wait. If you want to pay less than the asking price, propose other terms that will make your offer more attractive to the seller, such as a speedy closing with no conditions.Once he or she reviews the offer, the seller lets you know whether he or she accepts it or rejects it. 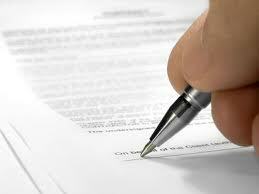 The seller may write a counter-offer derived from your initial offer and send it back to you for reconsideration. This process may repeat itself, but, with any luck, will resolve one way or another within a few days.Don’t worry, however. Although this is serious negotiation, the agreement is not binding until both parties actually accept and sign the contract. It is hardly a good idea to arrange your closing and possession dates at the end of the month (or, even worse, the end of the year). These times are busy for everyone. You will also have better luck with moving companies. If you are renting consider a closing date a week to 10 days before the end of the month so you don't lose too much in rent but also aren't moving out on the same day as other tenants. Ensure that the date of Completion (the day money changes hands) is not a Friday - early to midweek is always best, just in case there are any problems with the bank or Land Titles Office. Now that you know the important highlights of making an offer find out how to turn it into a firm deal and close it!